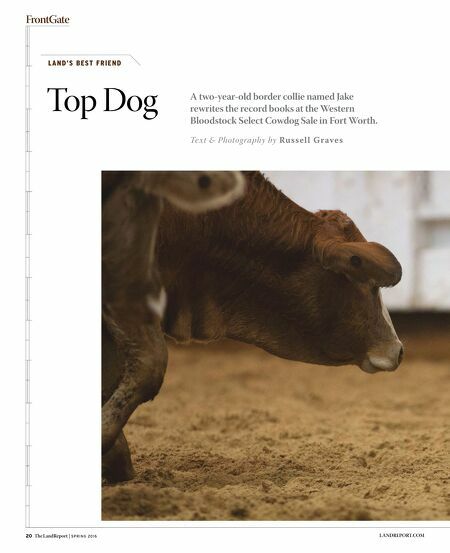 S P R I N G 2 0 1 6 | The LandReport 21 LANDREPORT.COM W atch him as he works the livestock," says Roy Cox. A beautiful border collie named Walker casts back and forth across an Oklahoma pasture, inching a small herd of Angus cattle forward. Roy's commands to Walker are soft, almost relaxing. "The whole time the cattle are moving, the dog stays calm. More important, the livestock stays calm," he says. Spooked cattle are stressed cattle. Stressed cattle lose weight; lost pounds means lost dollars. An Australia native, Cox, 56, moved to Texas in 1979 to train cutting horses. In short order, he was running cattle on his own place in Southern Oklahoma. Back home in Australia, the Cox family used cattle dogs on their dairy farm near Buchanan in New South Wales. Not surprisingly, Roy began training one for his own use. Jake eyes a wary steer at the Will Rogers Equestrian Center on December 9. 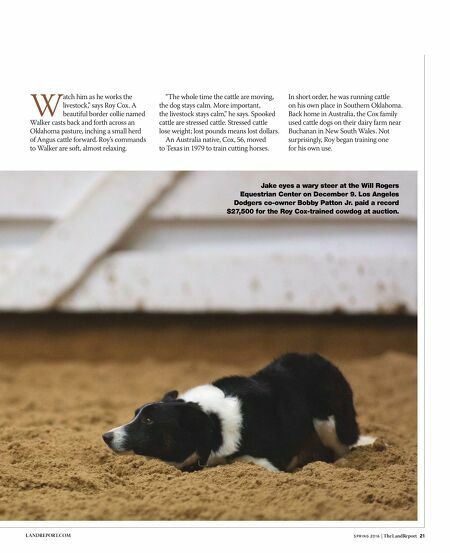 Los Angeles Dodgers co-owner Bobby Patton Jr. paid a record $27,500 for the Roy Cox-trained cowdog at auction.